I could never have let the day go by without making some reference to the famous Scopes "Monkey" Trial of 1925. In a sleepy town in Dayton,Tennessee the new State Law against teaching Evolution in the Public Schools was drawing to a close. With Clarence Darrow for the Defense; versus William Jennings Bryan for the Prosecution; this would be the trial that killed Bryan. His beliefs where shattered by the brilliant defense presented by Clarence Darrow. The teacher in question, John Scopes, was found guilty of violating the State Prohibition against teaching Evolution. But Darrow had made his point. The law was later struck down and the controversy over this subject still rages, across the land, today. Take a minute, or three, and watch this video. It is a compilation of actual courtroom dialogue between the two great men, along with some scenes from the movie "Inherit the Wind" with Spencer Tracy and Frederic March playing the two attorneys. 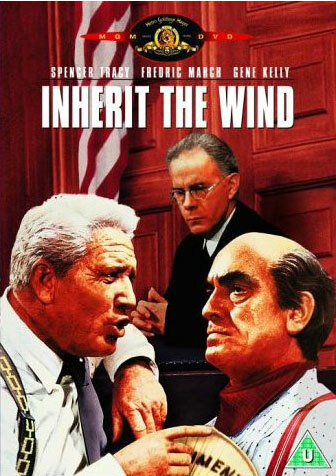 In most places the movie consists of exact quotations from the trial. Some of the most soaring rhetoric comes from the actual transcript. But what a difference in delivery! This film will give you the opportunity to compare them. And as a side note, the famous summation of the case was conducted outdoors in the Town Square, rather than the Courtroom. There was not enough room for the all of the spectators on that fateful last day of the trial. So, due to the combination of very hot weather and overcrowding, the last day of the case was argued outdoors. Enjoy the film, it's pretty good stuff. Today is the anniversary of the last day of this legendary trial, and is worth noting.